I is for Insights | True story. Really. Back in November I participated in National Novel Writing Month, or NaNoWriMo for those who are too busy for all those extra syllables. After I hit 50,000 words and got myself certified as a ‘winner,’ I dutifully printed out the month’s work and tucked it away. The plan was to get some rest and some perspective, and return to it in January. I even made up a schedule with milestones and deadlines and everything. Are you familiar with that Douglas Adams quote about deadlines? It’s been a little bit like that around here. So around March 21, I decided that there was nothing for it but to take on way more than I could possibly accomplish, and by the end of the month I had signed up for not one but two big April challenges. All of the preparation I did before starting these projects got me ready, but it didn’t actually prepare me. Schedules and outlines are great, but everything changed once I started actually writing. On the other hand, if I hadn’t done the prep work, I would really be up the creek. It’s weird. Writing 2000 words a day is both harder and easier than I expected. The first 500 or so words are the hardest. The last 500 words go pretty fast. At 2000 words, I am exhausted and need a nap. I am, suddenly, a terrible judge of my own writing. Other folks say things like ‘This scene I am working on is so boring’ or ‘My main character isn’t acting right’ and all I can think is ‘How can you tell?’ This is not usually the case when I write, but then, I don’t usually write the way I am writing right now. There is an abundance of good writing/blogging advice and encouragement available online. More appears all the time. A person could spend hours every day reading it, but then when would they actually write? Getting caught up on reading it all is a permanent fixture on my to-do list. Poetry! Who knew? Probably the biggest and most pleasant surprise for me so far this month is how big a part poetry has played – sharing my own, and sharing and exploring the work of others. If you had asked me about poetry back in February, I would probably have said that I don’t really think about it much. Turns out that I do, though, and I have a lot of favorites that I want to share. Has April brought you any interesting insights? This entry was posted in Challenges, Miscellany, Tools and tips and tagged #atozchallenge. Bookmark the permalink. Yes! The writing has given me insights, as well as reading other blog posts. 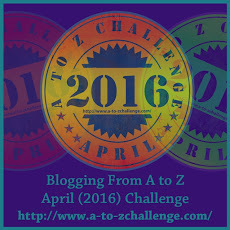 April’s A to Z Challenge has been such a positive experience. Agreed! My only regret is that doing both challenges hasn’t left me with much time to keep up with other folks’ blogs. Have a great month! I try to check out 5-10 blogs a day. That’s about all I can manage. That’s really interesting. My NaNo effort could very well amount to nothing, but the process is sure to be a good learning experience, if nothing else. Going back to the work feels good, too. But seven blogs? That is very impressive. I can barely keep up with the one. I look forward to checking out some of your stuff. Have a good month.